Over at Wartburg Watch some comments have indicated that HBC has another suit pending and has clarified what the suit is, at least in terms of who vs who. an interview that wasn't, The Morning Invasion podcast ends up having an October 17, 2018 podcast on how they ended up not interviewing Mark Driscoll in response to things indicated by a publicist. The Morning Invasion podcast is also available on iTunes. The first half hour is what is of interest for this podcast dated October 17, 2018. The gist seems to be that the hosts were going to have an interview with Mark Driscoll but cancelled it when (according to statements made at roughly minutes 13 and 24 a publicist explained that respectively: 1) there were topics Mark Driscoll indicated he did not want to talk about and 2) he only wanted to talk about his new book. Under the circumstances it makes some sense to cancel an interview when presented with what would historically be a double bind. No one who has read Mark Driscoll's earlier books would be able to easily separate Mark Driscoll's accounts of his own life and times and that of his family from his more doctrinal or historical preaching and teaching materials. One of the hosts said that it doesn't seem like proof of repentance or that reconciliation has happened if there are any questions Mark Driscoll isn't willing to field about his time from Mars Hill. One of the hosts mentioned having met Driscoll over the years. Having met not just Mark Driscoll but the other co-founding pastors Mike Gunn and Lief Moi I find it hard to imagine that the way Mars Hill actually ended was the way any of the three wanted it to end. I do feel obliged to point out that Mark Driscoll's pseudonym was William Wallace II and he described that pseudonym in Confessions of a Reformission Rev as one he used on the old, unmoderated Midrash. I'm not aware of any times in which he used that pseudonym in any context except the Mars Hill Midrash. So even within Mars Hill insiders it can seem there has been room for misunderstanding what was going on. It doesn't seem there were any intentional inaccuracies on the part of the host or their guest but those details seemed worth noting. Compared to any and all citation errors and failures in the first editions of Mark Driscoll's published books across his earlier career such errors, however unfortunate, may be pardonable. A lot, an awful lot, can happen across a twenty year span and by the 2012-2014 period many of those people who could establish what they saw and heard had already left Mars Hill. There's another point made in the podcast by one of the hosts about how what was a tipping point for him was finding out Mars Hill had taken to consulting a public relations firm to handle its roughly 2014 era crises. It seemed unchurchlike for a church to resort to using a PR firm to manage the crises it was dealing with. Now Justin Dean's book PR Matters (reviewed here at Wenatchee The Hatchet with two historical preludes) might suggest strongly that a church that isn't engaged in the PR game as it's played these days has somehow already lost ... although it would seem that Mars Hill doesn't exist now and that might be a counter-argument, that those churches that believe their fate stands or falls on public relations could end up dying miserable public deaths. If you want to get a sense of how Mars Hill's public relations situation went from disaster to disaster of sizes ranging from small to great, here's a non-comprehensive but neverthelesss moderately thorough list. It won't include campus by campus resignations of elders, deacons or staff, because the turnover was too formidable in the 2011-2014 period to attempt to catalog everyone who was fired or resigned even here at Wenatchee The Hatchet. For those who weren't keeping track of things at the time Mars Hill was bleeding out leadership at the lower and mid-tier levels for a couple of years. While officially blogs weren't worth talking about there were a couple of attempts on the part of MH leaders to get in contact, documented in a brief form here. I stonewalled all of them, because it wasn't a personal thing. I wanted to chronicle things for the record as a journalistic service to the public. Rather than finding it intimidating (if annoying) getting contacted by MH leaders unilaterally suggested that the leaders were concerned about how much material was showing up at this blog from The City and other inside of Mars Hill sources that, as one friend put it, made the culture look bad. The friend said that it seemed that instead of asking themselves why they were doing and saying things that made them look bad they seemed worried as to how Wenatchee The Hatchet was getting so much material that seemed to cast the church in an incriminating light. Which is to say that Mars Hill leadership, if I may propose this, began to spiral into its death spiral because it prized public relations and reputation more than it prized how it was treating people. This blog has a lot of material on the history of the former church and perhaps I'll eventually have to create a page that indexes as much of this material as possible for the record. With Driscoll getting some representation from A Larry Ross rather than Justin Dean in the last year he can't help but have gotten more capable, even formidable, public relations help but the hosts of the podcast didn't name any names, they just indicated a publicist or publicist team explained that Driscoll only wanted to talk about his book and that there were topics he didn't want to talk about. For that, the interview got cancelled. It does invite a question as to what the basis can be for Mark Driscoll to hold himself now as an example for men to follow on manliness, accountability and legacy if he may prove unwilling to field questions about a roughly twenty year period of his ministry career which constitutes more or less the only pastoral role anyone could possibly remember him for as a matter of public record. The Trinity Church is, to attempt to put this in a Driscollian parlance, still in diapers. 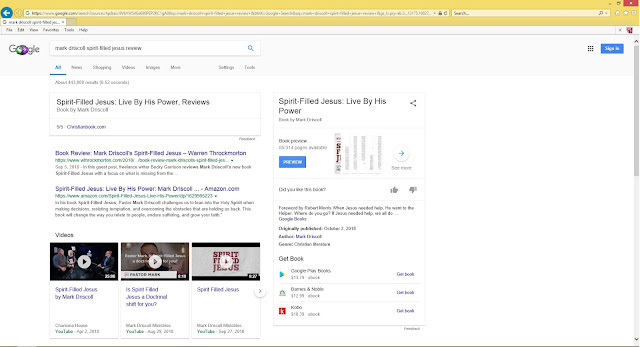 While we haven't gotten around to reading and reviewing Mark Driscoll's Spirit-Filled Jesus yet because listening to Hilary Hahn's new J. S. Bach CD is a higher priority at the moment the plan is to get around to reviewing the book since a copy can be easily acquired. But while that can happen soon (and it's interesting to note how readily you can get used copies that have "remainder mark" or "overstock" on them, and it's also fascinating to note the ratio of Amazon reviews in which reviewers mention receiving an advance or preview copy, it looks like the first search result you get if you look for a review of Mark Driscoll's Spirit-Filled Jesus in Google is Becky Garrison's review at Warren Throckmorton's website. and it's not just the case for Google. 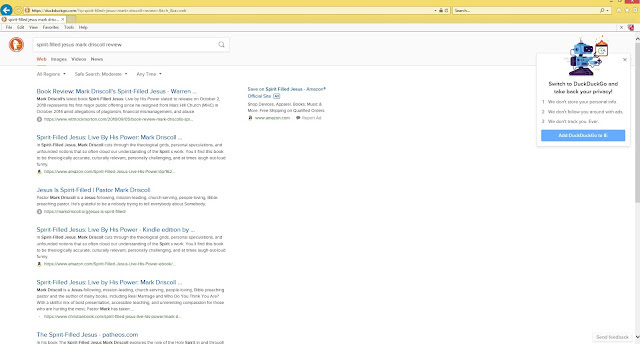 You get the same result this morning if you were to use duckduckgo. it's currently the second result after Amazon.com's listing and associated reviews if you use yahoo.com for your preferred search engine. A Mark Driscoll level joke about that would be that if you're the sort of yahoo who uses Yahoo as a search engine then, yahoo ... . I just got a copy in the mail in the last couple of days and hope to have something written about it in the next week or so. In the wake of allegations made against Harvey Weinstein; in the wake of allegations made against Sherman Alexie; in the wake of allegations made about a variety of other artists and producers of art ... I've been mulling over an old quote from Richard Wagner. If in a post Wagnerian conception of Art we could say that Art is the real or true religion then could it be said that what we've witnessed in the post-Weinstein moment or even a pre-Weinstein moment with someone like Woody Allen, what have we been looking at? And if Woody Allen's films did not pass muster with Richard Brody as art in the way that a film by Louis C. K. did not pass muster with Brody as art (in the limited sense that Brody claimed no distributor should have picked up the film to begin with even if C. K. had every right to make the sort of film he wanted to make), what would the verdict be? As Brody put it, "It’s good that the release of the movie has been cancelled—but it’s lamentable that it took the outing of Louis C.K.’s actual misconduct, rather than the movie’s own demerits, to get it off the calendar." But to declare that the movie's own demerits should have been held against it begs a question at the heart of why a Woody Allen film is sacred and a C. K. film isn't. If there has been in the West since Richard Wagner's "Art and Religion" a Western liberal art religion, the controversies that have swirled around filmmakers and comedians or filmmaker comedians seems to be ... some kind of Donatist controversy. Brody can, with the proverbial wave of a hand, dismiss C. K. as making films that are bereft of art and not worthy of distribution while Woody Allen, about whom Brody is willing to believe the allegations made against Allen, nevertheless has made films with some kind of sacramental power sufficient enough that allegations made about Allen, even if proven true, cannot detract from the artistry of Allen's filmography. Not that Brody is having a Donatist controversy style moment because, for Brody, the alleged misdeeds of Woody Allen are more or less inseparable from his artistry. But for those in the entertainment industries who would like artists to actually be good people in addition to making good art there could be a Donatist controversy, a question as to whether the art experience as a sacramental rite is vitiated in some way by the moral failures of heresies of artists. Now what I don't think this would necessarily speak to is what some people think is going on, which is that we're somehow being beset by some neo-Puritan ethos or praxis. The idea that some kind of puritanism is afoot seems improbable because for a man like Louis C. K. to be able to make movies at all would suggest the Puritan legacy has been left far, far behind in the United States. What's more, it's hard to shake the sense that to even make such a glib accounting of "why" we're at this culture moment in the time after allegations have been made against Harvey Weinstein could just be a residual master narrative about American history as a whole and art history as a subsidiary history within that master narrative--of Americans seeking to divest themselves of the negative impact of Puritanism. Well, Puritanism isn't as monolithic as it may be presented as being in stories ranging from The Crucible to The Witch. John Cotton and Roger Williams alone could seem like indicators that there was a spectrum within what we now know of as Puritanism. Brody could be considered someone who thinks there is such a thing as a Donatist heresy for a Western religion of art. There are others who regard the works of artists, authors and filmmakers who have been discovered to have been predatory and exploitive to in some way significantly impinge on the credibility or quality of their art, possibly to the point of questioning whether their works should be part of teaching curriculum. Sherman Alexie's work has already passed into such a controversy, with a teacher suspended for considering using an Alexie book in a teaching setting this year. What makes it seem improbable that this is a Puritan moment is simply a matter of considering who has been making what sorts of films and books and whether the films produced by Harvey Weinstein or the books of Sherman Alexie would be praised all that much by any contemporary writers, thinkers or pastors who would regard themselves as in some way positively influenced by the Puritans. I really enjoyed Alexie's short stories but his film was a tedious chore and I say this as someone who admires the Puritan Richard Sibbes. So, there, just at a personal level I would say there's a reason to question whether what we've been witnessing has much to do with some perceived negative influence on the arts in the early 21st century that's allegedly connected to Puritanism. I don't get the sense that most of the names attached to #MeToo and #TimesUp are openly espousing what would be considered views in keeping with Jonathan Edwards or John Owen. If anything, the calls for a new regime seem to be coming from quarters in which men and women are working who openly hope to be that new regime. In other words, to tie this to a proposal that we're seeing people propose that there can be a Donatist heresy for Western art religion, this moment could be thought of as a kind of intra-ecclesial battle between artists and critics who believe that art-makers should live lives consistent with the ideals they espouse as artists and even more so the lives they live as people, and a kind of old guard, if you will, committed to a more "catholic" conception of post-Wagnerian art religion in which very bad men and women who make art that is considered great enough get to have that art within the canon of art religion. In the case of a Bill Cosby it could be argued that precisely because he publicly set himself up as a moralist it is to the extent that he did that that his art has been vitiated by the judicial finding against him. When artists set out to make art that explicitly moralizes then it would seem there's a consistent position staked out in, so to speak, erasing Cosby from the art canon. There may be more room to forgive the mere hypocrite who fails to live up to his or her highest ideals than for the man or woman who traffics in egregious double standards. To give examples in the realm of music, we can recognize that Johnny Cash and Aretha Franklin may have fallen far short of the ideals they hoped and prayed to live by without necessarily assuming that because they may have failed to live by the ideals of their respective Christian convictions but still take them seriously as people and as artists. Can art as a religious experience still be sublime and life-affirming and give you a memorably abreactive experience if you know the art was made by someone who was an alcoholic who was physically abusive? Can you listen to, say, John Lennon songs and feel moved by their aspirations for love, peace and harmony despite knowing anything about his drinking or temper? What has been said time and again in the present is that if we judge artists of the past by the scruples of the present there might be no room left for any art. I.e. if we get rid of all the art made by monsters will any art be left? Well, that is to formulate the question in so rhetorical a fashion as to highlight why it seems like we're in a moment in which there may be a Donatist controversy about Western art as a religion. Colloquially the Donatists were those who proposed that there were sins bad enough that a priest committing them could lose the capacity to confer sacraments. That's a terribly simplified version of what the controversy was and its nature but I'm using Donatism as an analogy for what seems to have been going on in the post-Harvey Weinstein allegations moment we've been in. All of that is to say that I don't think you can have a Donatist controversy regarding art and artists if art isn't your religion. To take things back to Johnny Cash, for instance, there isn't a Donatist controversy style question for Cash because he wasn't exactly an ordained Baptist minister for one, and for another as a layperson he was not administering any sacraments as a Christian would define them, not even when performing songs or reading the Bible for an audio book recording (although ... anyway, let's set that off to one side). But for those to whom art is a religion it absolutely can be a controversy and perhaps even SHOULD be a controversy. It should be controversial that so many men who made art and literature and film that has been canonized as Art turn out to have been moderately bad men to legendarily evil men in their personal relationships. Perhaps there should be a Donatist controversy about Western art religion so as to establish what makes Art possess sacramental power at all, or to define what you can do or have to do to vitiate the possibly sacramental power art is expected to have. Why could a Richard Brody say that Woody Allen's films are still substantial art consumption experiences while a film by C. K. isn't? It's worth noting that one person's meat is another person's poison, as a saying has it. Mendelssohn thought highly of the music of Johann Sebastian Bach (as did Mozart), whereas Hector Berlioz was not so thrilled with Bach's work. Personally, not that anyone is really asking me what I think ... I'm just writing at my own blog here ... art is not a religion and shouldn't be a religion. Art can be beautiful and valuable and add a great deal to life as we live it, but to sacralize art seems it has gotten us to a point where there's a perceived crisis in whether artists who make what is regarded as good art who are regarded as terrible people that seems like it's a Donatist controversy for art-as-religion. People who have actual religious convictions in a more traditional sense don't really need to spend quite as much time in hand-wringing anxiety if they hold that art is actually a pretty lower tier consideration compared to, say, Eucharist or baptism. It's not that you can't have strong convictions about the arts, by any means, it's that for religiously observant people Art isn't a sacrament, let alone "the" sacrament that confers some aura of holiness on the producers or consumers of art in contemporary society. As Adorno put it so early in Aesthetic Theory, art shorn of all its last vestiges of ties to cultic practice, religious belief and sympathetic magic has faced a crisis in which the very legitimacy of its existence and basis for being cannot be taken as given. It's not a foregone conclusion that art has a "right" to exist because Western liberal art religion substituted "Art" for what had previously been the God of Catholicism and Christendom. But for those who do ardently and emphatically embrace some kind of Wagnerian style Art as religion perhaps there should always be a Donatist controversy. Perhaps we should always have a Tolstoy style advocacy that the artist to be an actually good artist must also in some way be a good human being. One of Richard Taruskin's many polemics about the idea that art should be formal and autonomous from personal or ethical or political considerations has been to avoid the recognition in scholarly and historical terms how many daring and innovative artists were fascists or racists or totalitarians ... an observation that doesn't settle well with liberal art religion precisely because it would be so much nicer if we could hear Stravinsky's music without remembering he had anti-Semitic comments ... but then John Lennon wasn't beyond anti-Semitic jokes, was he? And that may get us to the "will there be any art left?" It hasn't been clear to me that those who have defended art-as-religion have always been very clear about what would make Art a sacred experience or object. To ask rhetorically that we might have no art left if we got rid of the art of monsters doesn't answer the question as to what makes it "art" compared to not-art. The mere fact that Theodore Adorno could declare that on ideological grounds the Soviet Union was a society in which art could not happen doesn't mean the string quartets of Shostakovich actually aren't string quartets or "art". Similar things could be said about the string quartets of Weinberg or the piano music of Shchedrin. Which may get us to an observation against the idea that whatever we're facing in this possibly Donatist controversy about Western art religion that it has to do with puritanism, it has seemed as though the push against the sacrament of Art being valid if administered by the wrong sorts of people has come from a more progressive and even secularist direction. It's not to say that a neo-puritan couldn't ALSO argue against the validity of a sacrament administered by a reprobate or evil person ... it's just that the puritan narrative seems to be an off-the-shelf trope when used by those who would cast any and all moral crusades against artists with morally questionable lives that seems ... lazy east coast American boilerplate. I can't think of a more delicate way to put that and I could have put it less delicately, by far. I am still in incubation phase ... but I just had to get these thoughts out of my system by way of writing. It's been on my mind lately that when I see the points and counterpoints about the arts and men behaving badly ... it seemed that over the last thirty years those men-as-artists were often defended as being against puritan moralizing ... and yet we're in a moment in which it seems people want to (with cause!) walk back the idea that as long as the art is fine enough or transcendent enough or sacramental enough as an art-experience that the man or woman who made the art does or says in the not-acting-as-priest-of-art-as-religion can't have any bearing on how we understand or recognize about their art.